-Marvel's Black Panther (2018) stars Chadwick Boseman, Michael B. Jordan, Lupita Nyong'o, Danai Gurira, Forest Whitaker, Daniel Kaluuya, Angela Bassett, Andy Serkis, Martin Freeman, Florence Kasumba, Winston Duke, Sterling K. Brown and Letitia Wright. It was directed & written by Ryan Coogler (whose resume includes the great films Creed & Fruitvale Station). I'd almost compare this to Wonder Woman, where our main character, T'Challa (Boseman), is on a continual path of learning and enlightenment, all while truly staying very entertaining. This is a very different kind of Marvel film where we learn about an entire culture and what it stands for while it still addresses an age-old tale of oppression of a people, while considering if it should reveal itself in all its glory. Intertwined with that theme, we are presented with the challenge of an usurper who wishes to mold Wakanda into his own vision of power, while looking to take over the world with Wakanda's advanced technology. It's a classic tale of old-school versus new-school, while the old-school ways may take a lesson or two from the modern world, asking itself, do we continue to protect our ways or share with the world in the hopes of making the world a "one tribe" planet. With all this classic reflection going on, we are still handed a wonderfully crafted great Marvel popcorn flick, as we marvel at the new tech of T'Challa's new suit! This Marvel film was almost too smart for me to write up an intelligible review. Sometimes you can watch the first act, getting a gist of what the film is about, then let the second act define your idea a little bit more of how you feel about a film while the third act can either make or break the entire narrative, becoming a drawn out action fest that adds nothing but spectacle to a film, or, it continues to tell the core of the tale. 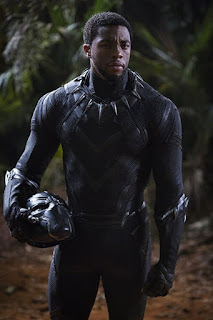 Buuut in this case, Black Panther has a tale to tell throughout, not once letting up the lessons that the characters continue to learn, and that's a bit of a rarity for most of the Marvel films. Director Coogler comes into this film with quite the resume of successes and he parlays his eye from those successes to this film, telling a story, working with Michael B. Jordan once again, and making great points. Boseman plays a regal character who strides gracefully through almost every scene he's in, while being able to get down and dirty when necessary. Additionally, we learn a ton about the character himself, his Black Panther lineage and where his skills, powers and abilities come from. 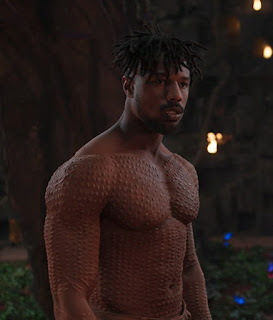 Jordan plays the jilted heir to the royal line wonderfully, portraying a classic Marvel character, Killmonger, though I'm a bit confused in that his character's name in most credits is Erik Killmonger, while in the film they say that he was nicknamed Killmonger due to his affinity to and track record of kills. Along with the story line, General Okoye (Gurira) represents another facet of true core values and her dedication to the throne itself. Throughout the film, CIA Agent Everett Ross (Freeman) was literally the only connective string to the rest of the Marvel universe of films, playing a non-minor, but not quite major role in the film. The last time we watched Andy Serkis play Klaue, he had a more somber role, but this time around, it seems he's a bit more maniacally entertained. I liked the change, it helps the role this character plays in the Marvel film universe for sure. This Is Us's Sterling K. Brown... he plays a character from the past, who delivers a moment that truly seems to be his strength. You'll see what I mean when you go see the film. I loved the tech, the humble nature of these people, while we watched a story with multiple levels of depth. The other thing I truly liked was that even though we've seen the trailers, I have to presume that Coogler had a hand in how they edited the trailers to not give away entire scenes. I loved seeing that, it left something fresh and fun to experience, unlike sometimes how they lay everything out in some waves of trailers. Here's a bit of curious trivia: Forest Whitaker plays Zuri, while flashbacks to the young Zuri is played by Denzel Whitaker, BUT, they are not related, even if it is good casting. If you haven't looked, Rotten Tomatoes gave Black Panther a 97% ratings, while IMDb users scored it at 7.8/10. If you round up, 8/10. If you go, you'll see it's money well spent! One of my only warnings though is that it seemed that they filmed the movie almost a bit too fast for 3D, making it a bit fuzzy to track at times. But otherwise, well, oof! It wasn't my first choice to see it in 3D, but that's when I was able to see it, and out where I live, well, a 3D ticket price is pretty cheap! If I tell you what I pay, you'll hate me!!! LOL.